Le Clos Fleuri Gîte Citadin with 3 "Pins" or Stars has a beautifully landscaped garden with lavender, edible herbs, fruit trees, vines, lillies and bamboo. There is a nice seating area in the central area of the garden shielded from the wind with a big umbrella. 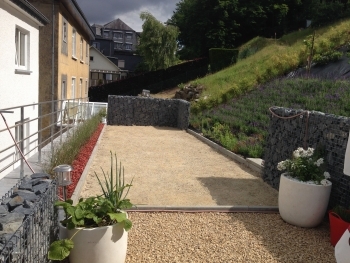 The petanque course is next to it and measures 9 by 3 meters! Enjoy your game in Le Clos Fleuri! 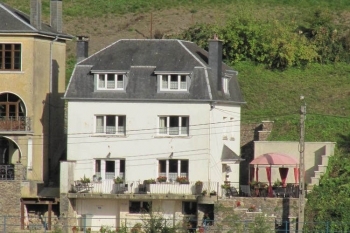 This renovated holiday home is located in the hills around Bouillon, with a view of the medieval fort. The modern kitchen is equipped with all necessary equipment. You can enjoy the sun on the south facing terrace. The garden has been entirely landscaped in different terrasses with flouwry plants, lavendal, herbs, one day lillies, fruittrees, vines and has a seperate lounge terras that overlooks the pétanque court. Thanks to the tourist train stop right on the doorstep, you can zip right to the centre of Bouillon. Sports lovers can also track the old railway bed on foot right into the centre of town. This area is known for its beautiful walks in the forest. You can also kayak, pedal boat or fish on the Semois. Gastronomic pleasure is certainly recommended in the game season (autumn). In short: something for everyone. The Rental price is based on the days of the wek and the period during the year. Breakfast can be taken in the hotel at 15 euro per person, reservations required.